Majestic Meiji/Taisho Period Kutani Japanese Porcelain Koro Phoenix Tripod Antique. 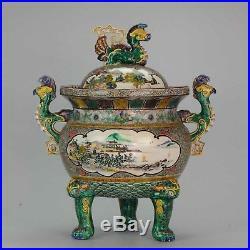 Lovely and majestic Japanese Porcelain Koro/Incense burner on tripod. Overall Condition D; Restored and 1 piece loose. Size; 530mm high and 450mm width approx. We can not control this. For China (& rest of Asia) & US allow at least 2 to 3 weeks. Depending on the situation it can take up to 1.5 month. This also influences the tracking data shown online. You can follow it at. The item "Majestic Meiji/Taisho Period Kutani Japanese Porcelain Koro Phoenix Tripod An" is in sale since Friday, April 13, 2018. This item is in the category "Antiques\Asian Antiques\China\Plates". The seller is "theceramics_and_collectibles" and is located in Amsterdam. This item can be shipped worldwide.